I don't know about you, but I don't like getting emails from Evite. They don't contain any information about the event you've been invited to and you're required to visit Evite's ugly, confusing, ad-laden website to respond. If you feel similarly (Time Magazine does), allow me to recommend Anyvite. It's dirt simple to use, the interface is a model of Web 2.0 cleanliness, and creating and sending an invitation is quick and effortless. 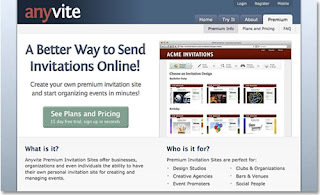 It does everything you need an online invitation to do with no mess and no fuss, and looks good doing it. yes!! i was just thinking today how annoying it was that they didn't put the event info in the email. you have to click on it and go to the site evertime. YEAH!!! Thanks, Justin! Love it!